by James K.A. Smith. Baker Academic, 2013. This is a theology book about worship and its formative power. The author cites sources as diverse as Rise of the Planet of the Apes to Pierre Bourdieu. Insisting that the purpose of the book is not academic pondering but the renewal of Christian practice, there are reflections on redeeming rituals as well as the power of story in Christian worship. This may not be a book for a broad audience, yet perhaps an essential book for clergy from traditions that value critical thinking about God, worship, and the narrative arc of human life. James K.A. Smith is Chair of Applied Reformed Theology and Worldview at Calvin College. 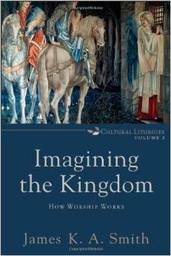 This is a follow-up book to Smith’s earlier Desiring the Kingdom. A key sentence that summarizes at least part of what Smith proposes in this creative and logical volume is “Ritual is the way we (learn to) believe with our bodies.” The first part of the book concentrates on theory, the second section of the book focuses on how worship works, how it functions in human life. Pastors looking for a serious study book for their local clergy group would do well to consider this volume.